At this time, you will begin focusing on the overall design of your degree. This means you will be focusing on courses that are of specific interest to you. At this time, you will begin focusing on the overall design of your degree. This means you will be focusing on courses that are of specific interest to you. Course recommendations can be made based on professional pathways, double majors, technical backgrounds, or even in preparation for graduate or doctoral studies. Prerequisite: ECN100A, 100B, MAT16A/B (or equivalent), STA13; does not require ECN102 but is more data-oriented, and ECN102 is recommended. Course description: Examination of fundamental problems of planning and financing transportation infrastructure. Prerequisite: ECN151A, does not require ECN102 and does not analyze date; however this course does require reading many important papers that are essentially regression studies. 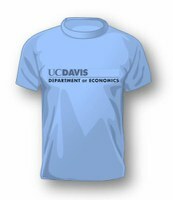 Course description: Human capital theory and economics of education; theory of wage differentials, labor market discrimination, income distribution, and poverty. Prerequisite: ECN100A, 100B, ECN102 or any upper division statistics course, MAT16A/B (or equivalent) with a C- grade or better. Course description: This course applies theoretical and empirical methods of economics to issues related to education and education policy. An econometrics or regression course will cover the regression model in more detail. It will generally involve more derivations of formulae. This is optimal for Economics majors. This is required for many graduate degrees. Students who are interested in minoring in another program are encouraged to begin coursework for your minor(s) in your third year also. You are now in progress to complete the remainder of your degree. We urge you to meet with an undergraduate academic advisor to ensure that you are completing your major requirements. You also should meet with an academic counselor at the College of Letters and Science to complete a final degree check. Consult the academic calendar to ensure that you meet all deadlines for petitions, which include filing to graduate and registering for commencement ceremonies. Remember, you may submit only one petition per academic quarter, and filing to graduate is considered a petition.